Last weekend spent well. Had a good time to revisit my very old recipes and looked the way how my cooking and the pictures have changed. One thing I noticed is that I haven't posted many recipes that my family prefer to eat very often, we even make it often either for breakfast or dinner. Sweet pongal is one of it and I don't remember having a festival (that are very traditional), special family occasions without the presence of it. 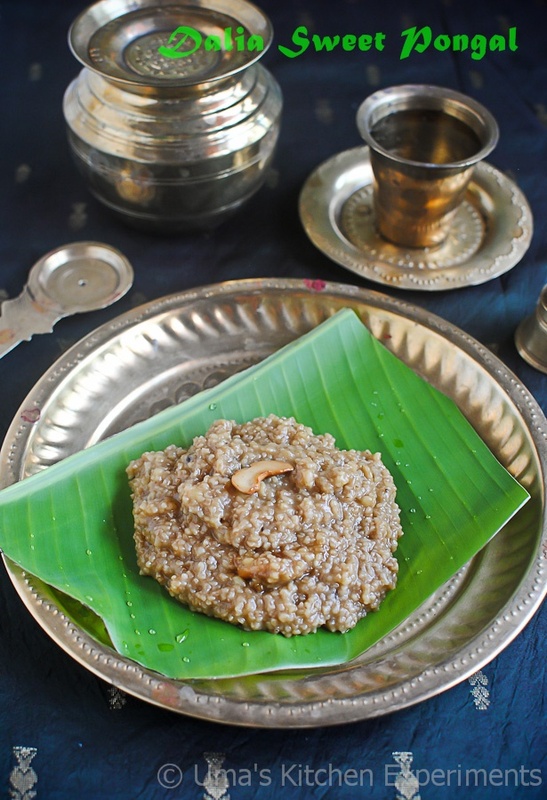 Traditionally, it is prepared using raw rice and moong dal without using milk. But for other variations we make it with milk, rava, gothuvai rava and karkandu(kalkandu). 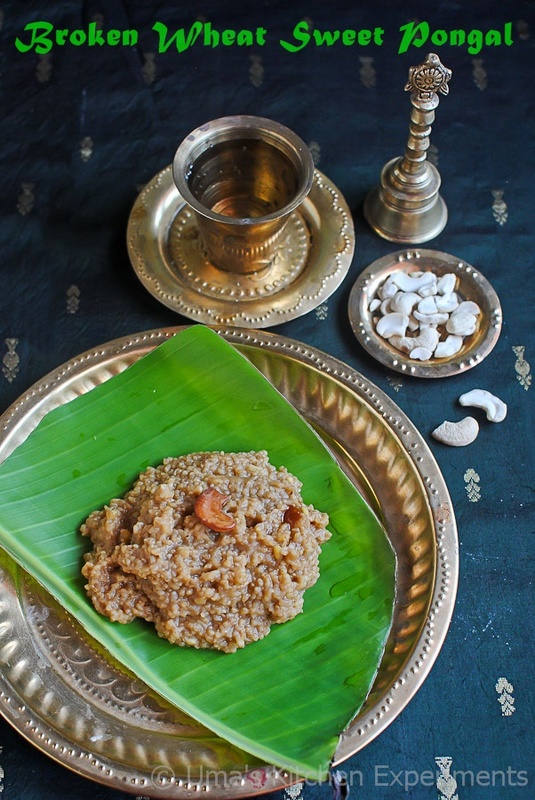 Even for the Koodaravalli that comes in the tamil month of Marghazhi, I decided to make it but my aunt saved all my time in the kitchen, sent me the box of tasty, sweet pongal. 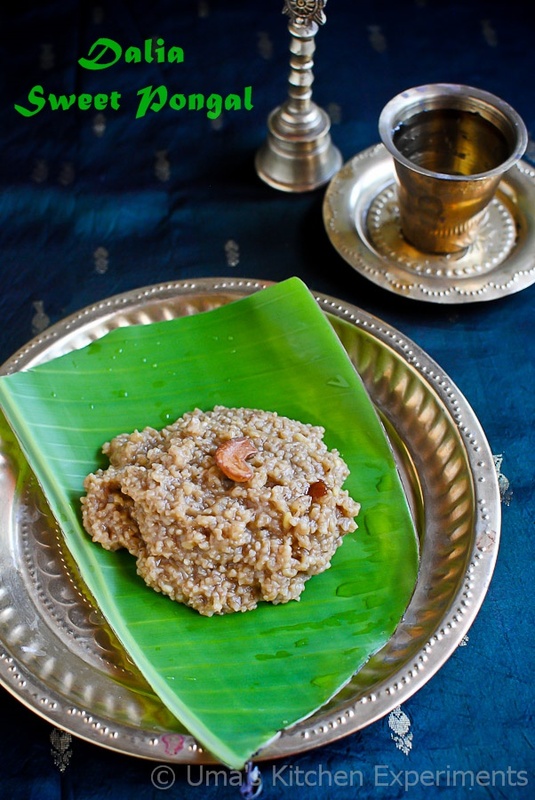 On my part, considering the upcoming pongal festival, I cooked the Sweet pongal again using one of the ingrdients - broken wheat, that my grandpa likes as Upma to eat it with curd, my husband likes it with Rasam(? ), my MIL likes to have as a Spicy pongal, myself like it with vegetables and the list never ends as my family is considered...This ingredient is favorite not only to my family members, but also for others whom and all I know. It is one common ingredient that is been used by all for its health benefits compared to white rava (semolina). Here is my preparation of sweet pongal using it. 1) Dry roast the broken wheat in a thick bottom pan till you see tiny white parts here and there and releases nice aroma.Transfer it to a plate. 2) To the same pan, add yellow moong dal and dry roast till it slightly changes in its colour. 3) Add both the roasted ingredients to the pressure cooker. Add 2 and 1/2 cups of water and pressure cook for 4 whistles. You can alternatively cook in the open pan itself. 4) Once the steam suppresses, open the lid and mash it well. 5) Melt jaggery by adding 1/2 cup of water. when it is about the boil, filer it to remove impurities and add to the pressure cooked mixture. Mix well. 6) Add kadukkai powder and cardamom powder. 7) Heat ghee in the pan. Roast cashew nuts and raisins. 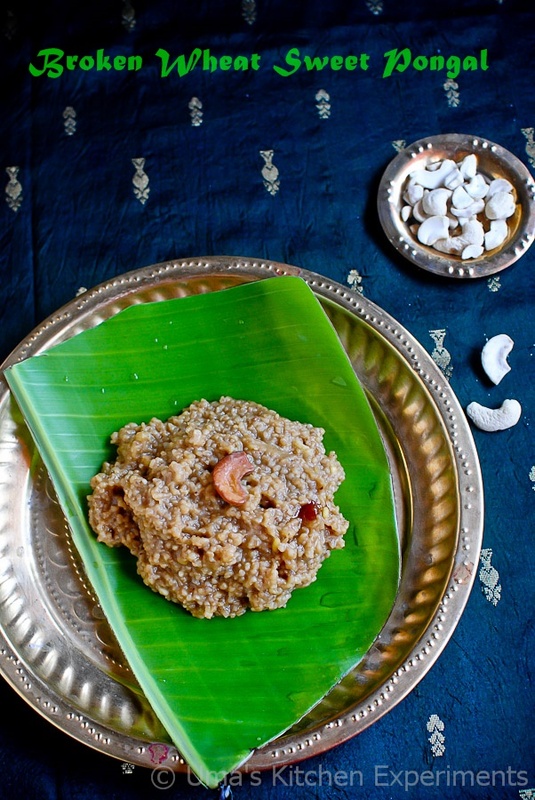 8) Add to the pongal along with the ghee. Mix well and serve hot. 1) Mash the cooked dalia when it is hot and as soon as you open the lid of pressure cooker, otherwise it tends to separate as grains. 2) Add hot water if you pongal is very thick to the given water consistency. It becomes thick when it cools down. So decide accordingly. wow uma! such a healthy pongal..